Venezuela forum debates prospects for revolutionary change in U.S.
2,500 sign up for the Militant! 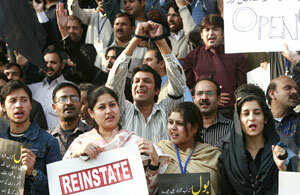 Journalists in Islamabad protest Pakistani government restrictions on media November 19. WASHINGTON, November 20Demonstrations against the Musharraf governments imposition of martial law took place in several cities across Pakistan in mid-November. Concerned about the political unrest, the White House dispatched U.S. deputy secretary of state John Negroponte to Islamabad November 16 to try to broker a governmental pact between Gen. Pervez Musharraf and opposition leader Benazir Bhutto. Washington hopes such a move could stabilize the regime, a key ally in the U.S.-led war in Afghanistan. In northwest Pakistan the army has launched an offensive in Swat, a mountainous area near the border with Afghanistan. After several weeks of fierce fighting, Islamist militias tied to al-Qaeda and the Taliban reportedly continue to control several towns and roads there. On November 19 hundreds of students and journalists demonstrated in the capital city of Islamabad against emergency rule. They rallied outside a banned television station to demand a lifting of curbs on the media, the Daily Times of Pakistan reported. Journalists have camped out in protest there for the past 10 days. Students, lawyers, and supporters of left-wing parties rallied the same day in Islamabad. It is now time to root out military dictatorship once and for all, said Aasim Sajjad, a leader of the Peoples Rights Movement. A student protest also took place at the Quaid-e-Azam University. The All Parties Democratic Movement (APDM), a group of anti-Musharraf parties, called for countrywide rallies against martial law on November 23, Bloomberg News reported. To try to undercut the growing protests, on November 20 the government freed 3,400 of the 15,000 or so people arrested under the emergency decree. It said another 2,000 would be released soon. Former prime minister Benazir Bhutto was released from house arrest the previous week. Hours after the 3,400 were freed, however, club-wielding cops in the southern city of Karachi attacked a demonstration by journalists, arresting more than 140 people. In Hyderabad police arrested 23 journalist protesters, according to Associated Press. The Musharraf government has announced elections for January 8. The APDM alliance has threatened to boycott the vote. Bhutto, head of the Pakistan Peoples Party, which is not part of the alliance, said she was considering a boycott. Musharraf suspended the constitution and dissolved the Supreme Court after being told the court was going to nullify his re-election as president last month on the basis that he is ineligible to continue while heading the military. On November 20 a newly hand-picked court rapidly rejected all but one challenge to his reelection. Musharraf says that once his reelection is upheld he will step down as army chief while remaining president. The U.S. government, seeking to stabilize the increasingly isolated regime, sent Negroponte to Islamabad to try to patch together a deal between Musharraf and Bhutto. Negroponte said that during his meeting with the general, he reiterated the White Houses demand to lift the state of emergency and for Musharraf to step down as army chief. Meanwhile, the Pakistani army is continuing its military offensive in the northwest border region. Some 15,000 troops were deployed for an assault on Islamist militias in Swat, according to a November 17 AP dispatch. The army said its troops, backed by helicopter gunships and artillery, were attempting to push the militias back into the mountains overlooking the Karakoram Highway, a vital trade route to China. Militia members of the Movement for the Enforcement of Islamic Laws captured a police headquarters in Alpuri, the New York Times reported November 16. Alpuris mayor said the local police abandoned the headquarters. At a November 14 press conference, Pentagon press secretary Geoff Morrell said the current political volatility in Pakistan posed a threat to U.S. military operations in Afghanistan. He said 75 percent of all supplies for the troops except ammunition goes through Pakistan. That includes 40 percent of fuel shipped directly from Pakistani refineries. Morrell added that U.S. aid to Pakistans military, nearly $10 billion since 2001, will continue. President Musharraf has been a steadfast ally in the war on terror since 9/11, and we are not stemming the flow of any of our military aid to Pakistan that goes to war on terror operations, he said.